Peaches are very common fruit. 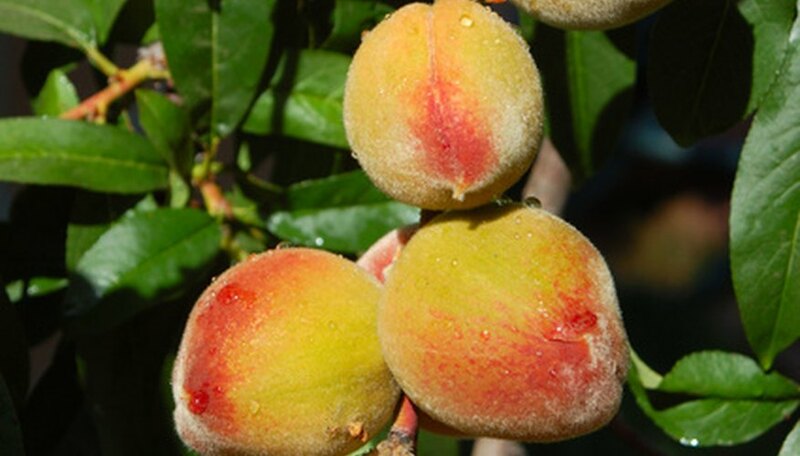 Peaches, closely related to nectarines, have fuzzy exteriors. They are normally found in temperate climates and are grown throughout areas such as California, Georgia, Pennsylvania, Washington, New Jersey and Louisiana. In areas that are not optimal for peach tree growing, peach trees can be placed in containers and moved indoors during frost. Peach trees grow faster than a lot of other trees and can reach the height of 20 feet. Peaches originated in China. The Chinese believed that peaches symbolized good luck, abundance and protection. The peaches were famous for surviving in very eroded soil and overgrazed areas. The French strongly associated peaches with femininity and gave peach trees feminine names. Peaches were brought to America by Spanish explorers and became popular among Native Americans. Native Americans played a large role in spreading peach trees throughout the United States. Peach trees need a great deal of sunlight in order to grow healthy. The tree should be exposed to early morning sun in order to dry up the dew that can lead to diseases. Peach trees do not survive well in areas that are poorly drained and have bad air circulation. Peach trees grow best with a soil pH of 6.5. Peach trees do well in a variety of soil types. Peach trees pollinate themselves and can produce fruit without other peach trees. Therefore, peaches can be grown with only one tree, since the ovaries will ripen into fruit without fertilization. Peach trees are vulnerable to weeds that compete for nutrients around the tree. Mulching is helpful in preventing weeds and will also help preserve moisture. Peach trees are vulnerable to pests, which can badly reduce the quality of the peaches. The flowers and fruit are vulnerable to brown rot, which creates cankers from which the disease spores emerge. Dark and velvety spots called peach scabs can appear on the outside of the fruit, though these scabs do not affect the inner part of the fruit. Rhizopus rot can develop on picked peaches that are stored at room temperature and will turn the peaches brown. The peach leaf curl disease attacks peach leaves and weakens the peach trees by reducing the amount of energy they get through photosynthesis. The roots of the peach tree are vulnerable both to root-knot nematodes and oak root rot. Peach tree fertilizer should include lime in addition to the phosphorus, nitrogen and potassium normally found in fertilizer. Calcium nitrate should also be added with the amount added increasing as the tree grows. Peaches are full of vitamins A and E. Peaches are also full of antioxidants and count as one serving of fruit. Peaches are sweet and are sometimes used as an alternative to sugar. Louisiana Tech University: Where do Peaches Grow?